Surfing in Peru has its roots in the Caballitos de Totora, a style of reed fishing boat that has been in use there for over three thousand years. These single seat boats are designed to coast along crashing waves, bringing fishermen and their catch safely to shore in areas where the seas can be temperamental. The Caballitos de Totora originated in the town of Huanchaco (pronounced ‘one-chako’), now a thriving surf town, and where the boats still form part of a vibrant cultural fabric. Modern surf in Peru didn’t take off until the late thirties, when Carlos Dogny the ‘father of Peruvian surfing,’ brought the first surfboard to the country, where the sport then prospered in the Miraflores area of Lima. Dogny returned to Peru having learned to surf in Honolulu, alongside other surfing giants, such as Duke Kahanamoku. Dogny continued to be at the centre of surfing’s evolution in Peru, later opening Club Waikiki in Lima. The first National Surfing Championships were held in 1950, adding to the growing interest in the sport. 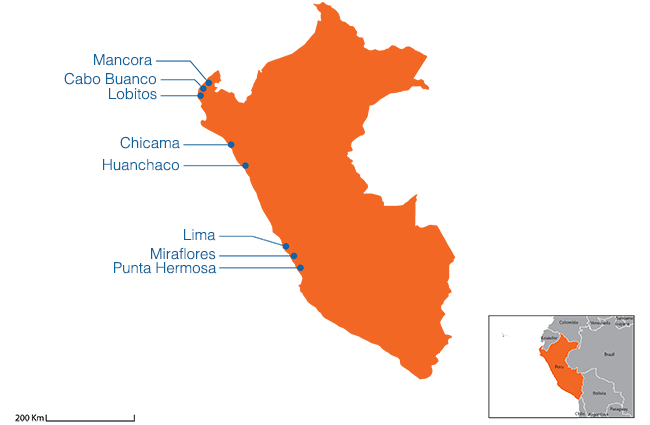 Over the following decades, now familiar surf spots were established to the North and South of Lima. Names like Punta Hermosa, Huanchaco and Mancora became staples of Peruvian surf vocabulary. It was within this time that Chicama was first surfed, now regarded as the longest left hand break in the world, and a mecca for any surfers travelling the North coast. The contemporary surf scene in Peru is thriving. Though not awash with international surfers yet, beaches are filled with Peruvians of all ages taking advantage of the incredible variety of waves. Successful surfers on the national scene include Luis Miguel (Magoo) de la Rossa who claimed the national championship seven times before travelling on the world circuit. Magoo would then go on to mentor one of the most successful female surfers ever, Sofia Mulanovich. Raised on the diverse breaks of Punta Hermosa, Mulanovich’s flowing style of surfing secured her the ASP world title 2004, making her the first South American to win the title. Mulanovich enjoys continued success, and has been inducted into the Surf Hall of Fame in Huntington Beach as recognition for her impact on the sport. Peru’s national policy recognises the inherent value of its surf heritage. In 2016 the Government approved the protection of Chicama by law, making it the only wave in the world to be officially protected by national law. This law secures the quality of Chicama for future generations, restricting the nature of any development in the area which would affect the quality of the wave. What's the surf like in Peru? Whether a seasoned pro or sticking your toes in the water for the first time, Peru’s diversity of waves will have you spoiled for choice. Beginning in Peru’s vibrant capital, Lima, and moving up the North Coast surfers will be able to find well populated breaks in established locations, mixed with inexplicably uncrowded gems, which can only be discovered with a bit of help from the locals. Fourty minutes south of the Miraflores district of Lima, lies Punta Hermosa. A well-known spot offering a huge variety of different breaks, the Punta Hermosa pilgrimage is one familiar to surfers living in Lima. This is not a beginner break and demands a certain amount of skill from those looking to surf here. Many surfers opt to stay in Barranco, the cultural quarter of Lima, taking a moto taxi or collectivo the short distance to Punta Hermosa. In the summer months (December to March), Punta Hermosa can become very busy. For those willing to sacrifice the sun and visit during the winter (May to September), you’ll be rewarded with an incredible variety of uncrowded waves within walking distance of each other. Don’t forget to pack your wetsuit though! Miraflores and Barranco sit side by side on the central coast of Lima. Both areas are incredibly tourist friendly and offer a multitude of things to do in and out of the water. Barranco is Lima’s cultural quarter, meaning it plays host to everything from beautiful street art to contemporary galleries. Barranco also has a thriving night life! At the foot of the Miraflores cliffs, is a beach break that is generally beginner friendly, and within a ten minute walk of the Miraflores and Barranco districts. This wave can be small and works best with longboards, or a board with lots of volume. This part of the central coast also has many surf guiding operators more than happy to help first time surfers get the best start possible. 570km and twelve hours North of Lima is the town of Huanchaco. Home of the famous Caballitos de totora boats, Huanchaco is now an established surf and tourist town, home to a growing number of Peru surf camps. The surrounding area also holds several important archaeological sites, which are open to tourists. A series of beach breaks that pick up a lot of swell surround this town. These beaches serve up everything from sheltered, beginner waves beyond the pier, to a variety of challenging left and right hand breaks. For those wanting to learn, this town is a great place to slow down and perfect your style. Huanchaco beach is made up of a series of mostly left hand breaks which on bigger days can be one continuous ride past the pier. A large swell will see Huanchaco’s consistent waves blown out and mushy. However, this doesn’t mean a day out of the water, but making the short trip to Chicama. Three hours up the coast from Huanchaco lies Chicama point. Not to be confused with Chicama town, Chicama point is a further fourty minutes from the town itself. A perfect wave in an unspoiled stretch of desert, this is one place that every surfer is invariably drawn to. Peru Surfing is synonymous with Chicama, the country's most famous wave, delivering perfect barrels and travelling up to 4KM on large swells. Smaller days mean no crowds and perfect conditions for learning. A good swell will see a busy line up, with many opting to rent a boat to bring them back to the point, rather than face the arm burning paddle back. Many opt to stay in Huanchaco when surfing Chicama. Due to the sparsity of amenities and it only working on bigger swells people tend to commute up when the conditions are right. The North coast of Peru is well connected by the Eppo bus service, which has stations in every major town and runs regularly. Accessible via Talara town and deep in the Peruvian north coast is Lobitos. Formerly a military and oil rigging town, the quality and consistency of waves in Lobitos are what cause many travellers to side line their plans and stay for twice as long as they’d originally intended. Working off a series of point breaks, Lobitos is a challenging place to learn surfing, but if you’re willing to dive in expect to improve rapidly. Lobitos point delivers fast, hollow tube sections that attract international surfers, and hosts national and international surf competitions. The pace of life in Lobitos is slow, many surfers opting to stay here long-term balance out their stay by travelling 70km up the coast to the buzzing Peru surf holiday town of Mancora. On flat days in Lobitos, the beautiful town of Los Organos, thirty minutes up the coast and easily reachable by bus, is a great place to chill out, swim with sea turtles and just enjoy the scenery! A short 3km journey North West of Talara and accessible via El Alto village, is Cabo Blanco. Famous for having played host to international jet setters of the 1950s and 60s, these days Cabo Blanco retains a reputation as one of the best pipelines in South America. Discovered by Gordo Barreda in 1979, this powerful left pipeline is tricky, breaks on shallow rock and should not be taken on by beginners. This spot works best between October and January, with a local surf competition being held every December. As an out of the way fishing village, Cabo Blanco is not flushed with amenities, hosting one hostel and one restaurant. For those travelling here that don’t want to take on the pipeline, you can enjoy the incredible location that inspired Ernest Hemingway’s The Old Man and The Sea. Only an hour from Lobitos, and approaching the border with Ecuador is Mancora. Famed in Peru as both a surf and party destination, if you’re looking to party all night and surf during the day, this is the place. Mancora has some of the best surf camps in Peru. The surf in Mancora throws up great beginner waves and the town hosts a series of surf schools all too happy to teach. More advanced surfers can find something to keep them happy here too. As long as you’re willing to strike a balance between the 24hr party and surfing, Mancora has something to offer everyone! Weather conditions in Lima and the central coast are dominated by the Humboldt Current, and during the winter months (May to September) can be cool, with the sky generally staying a murky grey. Summer (December to March) in the Lima region sees temperatures landing in the region of 28°C/82°F. It hardly ever rains in Peru. The central coast in winter (May to September) does not get much sun, and the water stays cold year-round. Though this means less crowded waves it also means that, in winter as far up as Huanchaco, you’ll want to have at least a spring suit handy instead of shorts and bikins! Moving North along the coast between May and September, expect to see the colour of the sandy beaches change from dense black to white, as the desert sun burns away all remnants of the Peruvian winter. Booties are a necessity on many of the beaches to guard against rocks, urchins and in desert regions, the occasional manta ray. Once you reach desert however, you’ll be most comfortable in a shorty or rash vest and shorts. That desert sun can be seriously damaging, and you’ll find it difficult to find a surf shop while travelling, so stock up on sun screen and any extras you might need in Lima or Trujillo before heading north. For a more detailed look at when & where to surf in Peru for your surf level use our Surf Trip Finder. Then browse each destination to discover the best selection & lowest prices. We have a great choice of accommodation & lessons in Peru's best surf towns. Book your surf holiday online now!